From an oil painting of the British railway poster entitled heysham by Claude Buckle. This painting is included again to illustrate as a supreme example of ‘celebration of the sea’ being the theme for RSMA. "Heysham for Belfast and Northern Ireland overnight in comfort by the latest and most luxurious cross-channel ship all fitted with anti-roll stabilizers reads the advertisement. 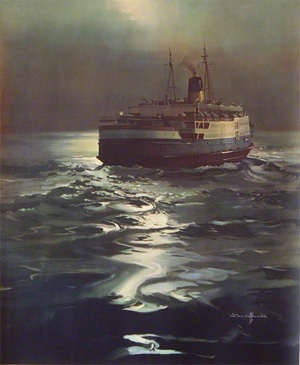 Claude Buckle’s oil painting captures the night crossing of the ferry with the moon clearly reflected in the water. This is a very good example of marine art. Claude Buckle captured the theme of painting ships at night three times in his poster work. Created in 1951.